A Chromecast media streamer for Linux. 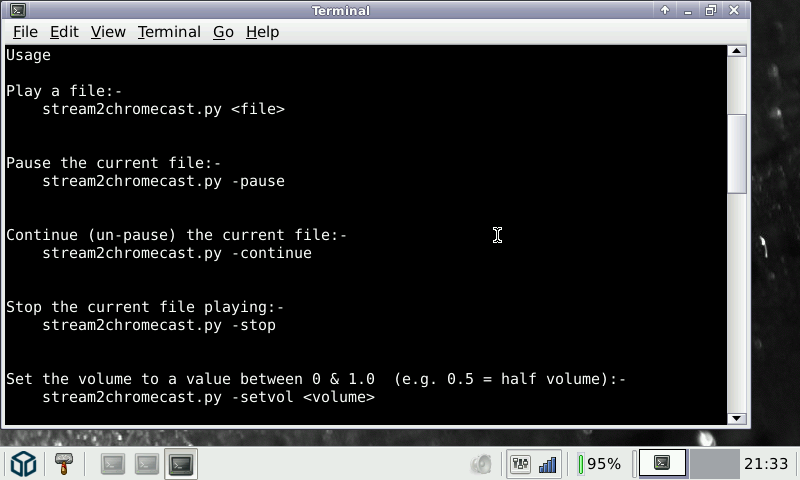 Stream2Chromecast casts audio and video files to a Chromecast device from Linux. It can also transcode any unsupported files in real time and play them on the Chromecast. It is written in Python 2.7 and uses either ffmpeg or avconv for transcoding. Here is Stream2Cast, a media streamer to Chromecast devices. Stream2Chromecast casts audio and video files to a Chromecast device from Pandora. It can also transcode any unsupported files in real time and play them on the Chromecast. It is written in Python 2.7 and uses either ffmpeg for transcoding. FFmpeg is embeded in the PND, but for python, it will use wxPython that need to be somewhere in your Pandora. Stream2Chromecast is a command line only software (the comands are display at start).